Yesterday I was walking to meet my daughter, Emmaline at the bus stop. Rain was blowing in my face and I was squinting against the shining sun. I suddenly remembered something my step-dad, Thomas told me years ago. Under these conditions there is ALWAYS a rainbow. You just have to turn away from the sun. I turned around and there was a fully arched rainbow! And... one end of it started at my house!!! I stood for a moment smiling at this happy site, when a man in a car drove past. 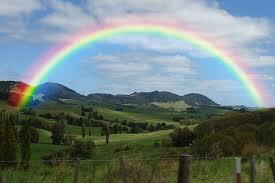 I pointed urgently behind him and mouthed, "Rainbow!" I am not sure if he understood or thought I was crazy, but I realized that it was the artist in me that wanted so desperately to share that beautiful miraculous moment. And that is what art is all about. Sharing. Enter your Best Gift Idea! New Storytelling Photos- Thank you Lisa!